“I would like to show by my work what this nobody has in his heart. Your loving Vincent.” – Vincent van Gogh (30 Mar 1853 – 29 Jul 1890) in a letter to his brother Theo. Like Vincent, I too would like to show through my work what is dearest to my heart. “Inside, Looking Out – Theme and Variations.” At left in the photo is my second oil painting done in the late summer of 1973. The accompanying three variations were created over forty years later, in the springs of 2014 and 2017. All four paintings are now hanging on consignment in the law offices of Charleson, Braber, McCabe & Denmark, Center City Philadelphia. Thank you Liam!!! 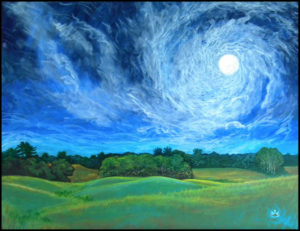 An interesting coincidence: both Vincent and I started painting in our late 20s, a result of our first Saturn Return, an astrological transit that is always life altering. On Tuesday November 7th, I saw the movie “Loving Vincent” – one of the most extraordinary cinematic experiences I have had the good fortunate to see on the big screen and feel to the depths of my soul. Did Vincent commit suicide as he was reputed to have done? or was it a tragic accident?? This probing drama which brings Vincent’s paintings to life through the combined medium of animation and special effects, questions the official record, opening up a debate about what really happened, providing a variety of possible options to an ultimately unanswerable question. 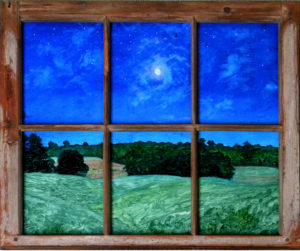 “Inside, Looking Out #19” aka “Intervale Moonrise” – acrylics of plywood panel, framed in antique window sash 28″ x 34″ – collection of Selena Starbard. 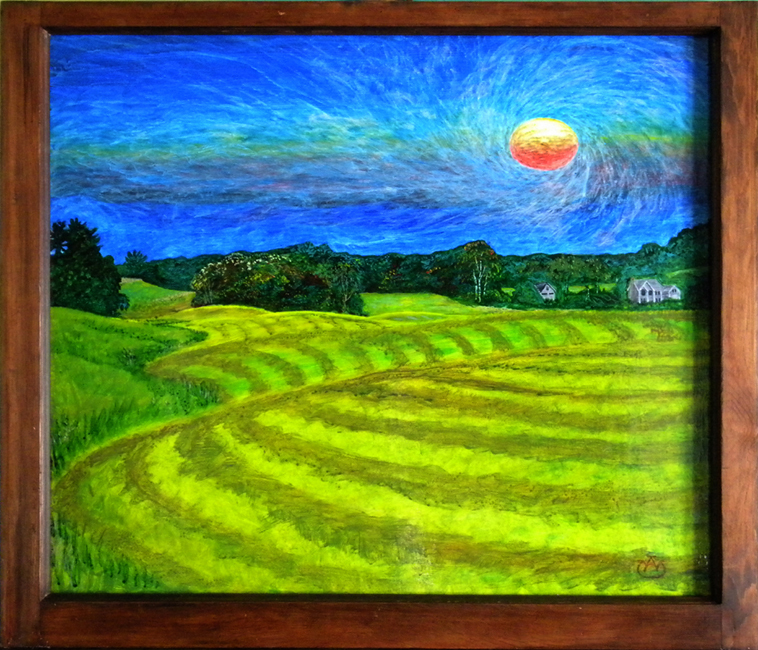 This work painted in Maine during the late summer of 2013 is probably the one painting in my own personal oeuvre to date that is most profoundly influenced by Vincent’s extraordinary work. At the top, I’ve featured it without a frame; just above is how the painting is actually displayed and enjoyed. 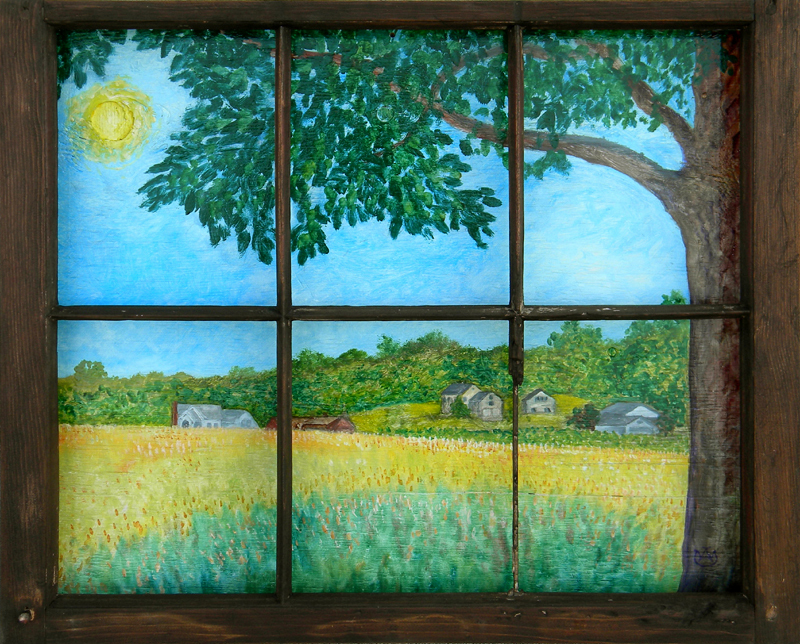 This is one of a series of paintings that utilize old window sashes found in Maine and elsewhere, two more of which are featured below. 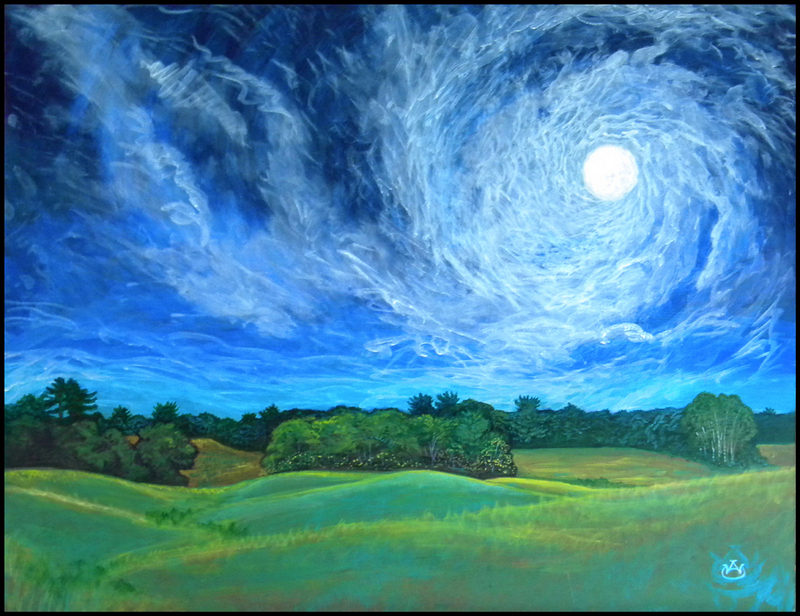 2012: Down the Intervale #9 – aka Intervale Moonrise #1 – aka Inside, Looking Out #11 – now renamed Starry Starry Night #1 in honor of Vincent whose creative explorations have increasingly inspired my own. 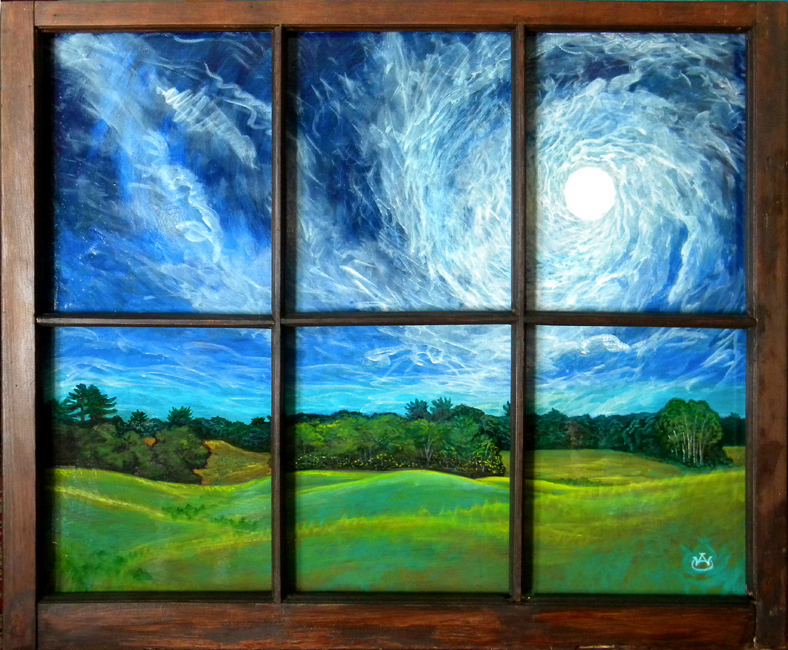 Oil on plywood panel, framed in antique window sash 21″ x 25″ – collection of Carley Dunn. My connection to Vincent goes back to my teens when I first saw Starry Night – one of Vincent’s most famous images – in a volume of John Canaday’s Seminars in Art published between 1958 and 1960 by the Metropolitan Museum of Art. This mid-twentieth-century series promoting culture for the millions had a profound effect on my creative tastes as a teenager, and my subsequent artistic development. 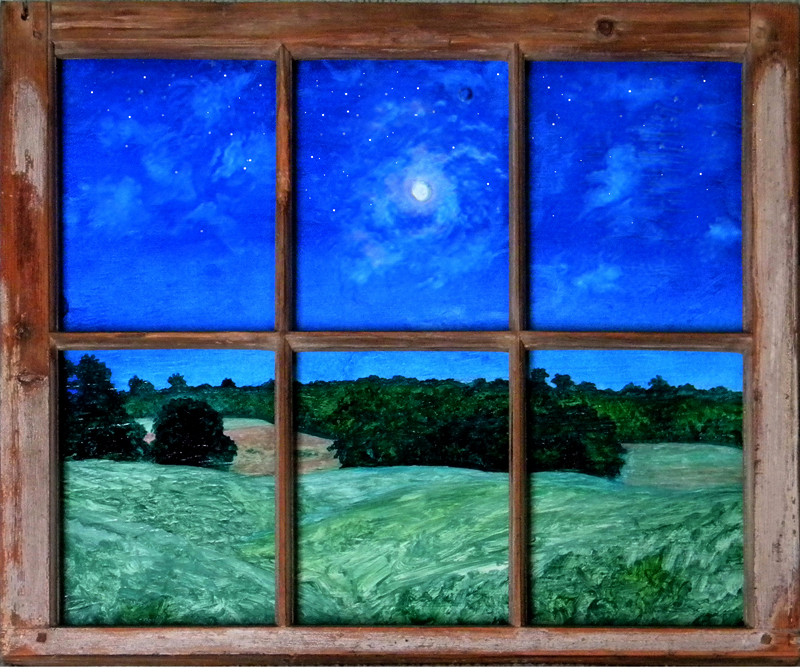 2013: Intervale Moonrise #2 aka Moonrise and Windrows – acrylics on plywood panel framed in antique window sash 27″ x 32″ – collection of Liam & Missy Braber. When I first encountered Vincent’s outrageous painting style noted for his use of impasto – the thick layering of pigment – I was not impressed. To my eyes, it looked like the sloppy work of a child. My early tastes had been defined by the illustrative rather than the painterly, having been raised on the likes of Norman Rockwell, Maxfield Parrish and N.C. Wyeth instead of Jackson Pollack, Willem de Kooning and Mark Rothko. What impressed me about the making of art was the creation of illusion: achieving a realistic 3-dimensional effect on a flat 2-dimensional surface. To my eye, Vincent’s style was too raw, unrealistic, fantastical even. But in time, Vincent’s work grew on me; an acquired taste, like caviar and brussels sprouts, fine champagne and truffles. As my own art has matured and developed, so has my respect for the extraordinary artistry that Vincent explored in less than a decade between the time when he started painting at age 28, and his untimely death at age 37. In that brief span of time Vincent created over 800 paintings, numerous works on paper, as well as a treasure trove of correspondence written to his brother Theo, who died within six months of Vincent’s death. Soul Mates? Their connection was remarkable. 2012: Down the Intervale #14 aka Haying Season – oil on plywood panel 9″ x 19″. Vincent reputedly sold only one painting during his lifetime, out of the hundreds that he created. Whenever I get discouraged questioning my own life as an artist, I remind myself that I’ve been fortunate to have sold a number of my paintings over the years to friends and admirers; a reminder that there are many people in my life who truly wish me the best. As one California friend put it recently: “Please feel as good about yourself as I feel about you.” Thank you Jerry!